I wanted to say a BIG thank you! 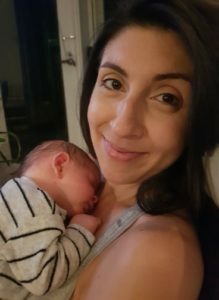 I had the most incredibly positive birth. I did my Hypnobirthing Australia™ course at 26 weeks with the lovely Kathryn Bell from Kathryn Bell Birth Support in Sydney. I used the tracks daily and can’t thank you enough for how much they prepared me and my partner for my birth. I have never been so proud of myself as I was the day I gave birth to my little boy, Freddy. I was 39 weeks and 5 days when my labour began. That day I had, had acupuncture to help induce labour. After the acupuncture, I walked about 4 kilometres to the top of the headland at my local beach. As I walked, I listened to my pregnancy affirmations – once at the top I sat on a seat overlooking the ocean and took deep breaths in through my nose and out through my nose. I had a feeling that the baby would be coming that night. At around 10 PM, I started to feel the first inklings of surges. I told my partner that I thought the baby was on his way – but of course, he didn’t believe me! I had been told that the best thing to do during early labour was to rest – so I went to bed as normal listening to my ‘Surge of the Sea’ track. At 5 AM, I couldn’t lie down any more and could feel the surges increasing in intensity. I decided to get up and start letting gravity do some work! I got in the shower, which felt so much better. As each surge began, I spoke to Freddy out loud – telling him to ‘move down, push down’ as I visualised him in the optimal position for birth. I lost track of time as I listened to my hypnobirthing tracks and breathed through each surge. I ended up being in there for 3 hours! I had told my husband to sleep so that he would have the energy for later on. Around 8 AM in between surges – I messaged my mum to tell her that I was in labour. She panicked a little bit and said, ‘What are you doing! Get to the hospital!’. I hadn’t been measuring my surges – but my mum’s concern was enough for me to wake my partner and get him to measure them. They were now about 2-3 minutes apart. It was peak hour – and we had to get to the hospital, which was about an hour away. grabbed my hospital bag and got in the car. As soon as I was in the car, I put on an eye mask and kept my hypnobirthing tracks playing through my headphones. Between surges, I sucked on coconut water ice blocks to keep hydrated. Both my partner and I were so calm on that trip. Neither of us spoke. I had no concept of how long the trip took – how much traffic there was – how many red lights we stopped at. I was completely in the zone. When we got to the hospital they were really busy. I was put in a waiting room and then a nurse came to assess me. She said that as it was my first baby I may not be as far along as I thought and I may need to go for a walk to get things going. I said that was fine – I was just happy I had made it to the hospital! She did a quick check and I was a little further along than she thought. I was 6 centimetres dilated and they quickly got the birth suite ready for me. Once in the birth suite – I got straight back in the shower. My husband put my hypnobirthing tracks back on and I put my eye mask on so that I was not distracted by anyone coming or going in the room. At around 10am, my obstetrician came to check me. I had made it to 8cm. He told me to keep doing what I was doing and that he would be back soon. e would squeeze my hips as I swayed under the shower. When they ended I would slump down on my exercise ball and rest as my husband ran hot water on my back. At each surge – I forced myself to stand to make sure gravity was doing its job even though it was getting harder and harder to get to my feet. The doctor checked me about an hour later and I was still 8cm – he asked to break my waters and I agreed – knowing that my mother’s waters had not broken for any of her births. Soon after they broke, I hit transition. Having been standing for the majority of my labour – I was beginning to get very, very tired. At this point, I started to lose some focus as I took off my eye mask and just kept saying ‘I’m so tired, I can’t do it, I’m so tired!’ The midwife and my husband convinced me to lie down. The surges were a lot more intense lying down – but I was relaxed enough to be able to sleep in between them and get some much needed rest. I didn’t like lying down – I remember saying to the midwife ‘I don’t think the baby will come if I’m lying down.’’ She told me to keep breathing. After an intense surge – I asked for the gas. This ended up being a good distraction as I watched the midwife prepare the gas and felt some relief that I would have something to get me through the next surge. However, after four breaths of the gas I removed the mask. It gave me a terrible head rush, which I really didn’t like. Soon after removing the mask, I began involuntary pushing. I was past transition. I remember hearing the nurse calling for the doctor and feeling pure relief ‘This is the end, he’s nearly here!”. It was the last surge of energy I needed and I got myself on to all fours. Pushing was the best part of my labour. I felt so strong and powerful. I made noises that I never knew I could make – I had no control over them they just emanated from my body. I felt like the entire room was vibrating with my voice. In between each surge, I spoke to my baby saying ‘Come on, Freddy, nearly there, we can do it!’ After three surges my beautiful boy was born. The doctor passed him through my legs and I will never forget how tightly my baby gripped on to my fingers. The first words I spoke to him were ‘We did it!”. I was so proud. The biggest thing that the Hypnobirthing Australia program taught me was no fear. I went into my birth excited – excited to meet my beautiful baby. At no point during my labour was I scared, panicked or fearful. I was purely focused on the present moment – with no focus on the surge that had passed or the surge that was coming. I truly believe that this lack of fear helped contribute to a beautiful and positive experience for me, my husband and my baby.